David Landau, a former partner in the firm, returned to the firm upon his retirement from the Appellate Division of the New Jersey Superior Court. He served as Supervising Judge of the Civil Appeals Settlement Program, as Presiding Judge of an Appellate Part, and headed the R. 1:36-2 Committee charged with approval of trial judge opinions submitted for possible publication. He previously served in the Law and Chancery (General Equity) Divisions of the Superior Court. 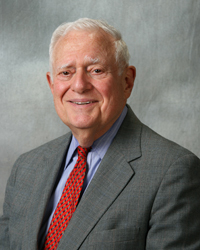 Prior to his initial membership in the firm, Judge Landau was a Deputy Attorney General assigned as counsel to the New Jersey Department of Banking and Insurance. During his years of practice with the firm before his judicial appointment, he represented clients in a wide range of business matters including Chancery practice, administrative law, labor relations, insurance, and real property taxation. He served as counsel to the New Jersey Insurance Law Commission during its revision of New Jersey’s life and health insurance statutes, recodified as Title 17B of the New Jersey Statutes. Judge Landau practices in the area of alternative dispute resolution, where he serves as a mediator and arbitrator. Captain, U.S. Air Force, active duty 1954-1956, Reserve to 1961 (Under warrant, negotiated contract termination settlements and price redeterminations for complex military contracts). Judge: New Jersey Superior Court, Appellate Division, 1986-2010; Chancery Division, 1983-1986; Law Division, 1977-1983. Supervising Judge, Civil Appeal Settlement Program, 2008-2010. Chair, Committee for Approval of Publication of Trial Court Opinions, 2006-2010. Deputy Attorney General (New Jersey) 1957-1962. Counsel to NJ Department of Banking and Insurance. Member: Board of Adjustment, City of Orange, 1958-1961; Charter Revision Commission, South Orange, New Jersey, 1969; American Law Institute, 1994—. Research Director, Harvard Law School Legislative Research Bureau. Rutgers College Crown and Scroll Society. President, Community Service Council of Orange and Maplewood. President, Jewish Vocational Service. Board Member, Regional United Way.